Yet another successful week for anglers on the Moy system, with 945 salmon reported, bringing the yearly total, so far, to 4,735. After a big flood over the previous weekend, angling peaked during the first half of the week resulting in very good fishing conditions upstream of Ballina. Lures and the worm proved to be the most successful methods while water levels were on the high side. Due to the higher water levels, angling on the Moy Fishery was rather slow this past week with only 15 salmon being caught. Amongst the successful anglers were Roy Taylor, UK, and Kevin Enright, Limerick, who both had a grilse on the Ridge Pool. The Mount Falcon Fishery topped its good result of last week with a total of 69 salmon for the week. UK anglers Garry Perks & Mike Hornsby were particularly successful accounting for 32 fish (14 released) using all methods. The Coolcronan Fishery also saw its best week of the season with lady angler, Marie Anderson from the UK, catching a nice 6.5 lbs. grilse on the worm. At Gannon's, Patrick Zollinker from Switzerland had two fish on bubble & fly, while John Logan, Dublin, landed a cracking ten pounder (on spinner) on the Foxford Fishery. Cian O'Bourke from Crossmolina certainly celebrated his 15th birthday catching his first ever salmon on the River Moy at Foxford. Cian was using bubble & fly and hooked his fish on an Orange & Gold Shrimp pattern. There were also a lot of happy faces at the Cloongee Fishery with over 60 salmon reported for the week. Amongst the successful anglers were Paul Burgess, UK and Jimmy Scotson from Monaghan who caught a fine 12.5 lbs. fish on spinner. German flyanglers, Lutz Koch and Kai Duscher, had great sport on the East Mayo water with several salmon up to 7.5 lbs., while fellow countryman, Lothar Waldeck, was also successful on East Mayo catching two grilse on spinner. Made himself the nicest birthday present: 15 year old Cian O’Bourke with his first ever salmon! Over the past two weeks the Ballisodare Fishery produced a total of 312 salmon with over a 3rd of these being released. Fly and the worm were the most productive methods, with the prawn taking good numbers of fish at the Falls. A "cocktail" of purple and natural colours has been working best. Popular flies included the ever-popular Cascade in several variations, Thunderflash, Stoats Tail, Willie Gunn and Arctic Shrimp patterns, mainly in small sizes. Most fish landed were between 4 lbs. and 6 lbs. However, the best fish over the past two weeks was caught by Andrew Pearson who struck gold when he hooked a fine sea-liced fish at the Falls on Saturday July 25th weighing just a shade under 9 lbs. Andrew's fish took a Posh Tosh. On July 14th the Ballisodare Fishery hosted its annual "Kid's Day" which was a great success. A total of 60 young anglers participated in this event and everyone was catching fish. A great day by anyone's standards! Ballisodare Fishing Club would like to thank all involved and everyone who helped out, including IFI and all sponsors, without whom the day would not have been possible. A big thank you goes to Ken Tucker of Douglas Jewellers in Carlow for sponsoring all the trophies. For information and bookings please check www.ballisodarefishingclub.ie. The Peter fishing on Lough Arrow is still in full swing with anglers reporting good evening action fishing sedges. Peter Dunne had 4 trout for the week, best at 3.5 lbs., while Francie White caught two, heaviest 3 lbs. However, it was Simon Steel who had one of the best fish of the week, a fine 4 lbs. trout. Simon's trout took a G &H Sedge. Other successful anglers included Gerry Martin with 2 trout for 2.25 lbs. and 2.5 lbs., Brian Hargadon with a two pounder and UK visitor, Hector Pearson who also boated a 2 lbs. trout. Donal Kennedy, skipper of the Leah, reported on two terrific days fishing in Killala Bay. 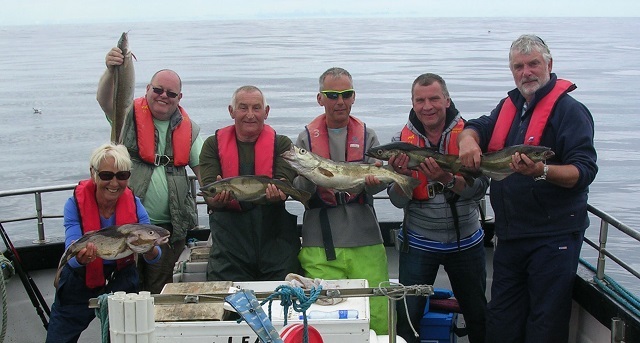 On July 24th & 25th, a party of anglers from Larne set out to fish Killala Bay. The weather was excellent and the sea was calm . . .everything was set for two great days of fishing! The group caught a phenomenal 19 species over the two days including ling up to 6 lbs., cod up to 7 lbs. and pollack up to 12 lbs. But what made this outing so special were the 7 species of ray that were caught and put back alive! The anglers had undulated, painted, homelyn, blonde, cuckoo and small eyed ray! They also caught and released two specimen thornback ray weighing 23 lbs. and 20 lbs. To book a day's fishing in Killala Bay contact Donal Kennedy on +353 (0)086 8174509 or visit www.dkennedyangling.net. Declan Gibbons reports from Lough Corrib. Starting in the Oughterard area, Basil Shields of Ardnasillagh Lodge (091-552550) reports excellent trout fishing for his clients; especially on mayfly and sedge patterns. On Saturday, Basil and Mallow angler, Neil Glavin, had 13 trout to the boat on dry mayfly patterns with the best fish being 2 lbs. 11oz. Earlier on Friday, Jim Buchannan, Armagh, fished with Basil and enjoyed a super day on wet flies catching 14 fish, best at 5 lbs. 6 oz. and all sportingly released. Limerick Duo John Burton and Mike Murphy had excellent fishing boating ten trout on wets with John catching the best fish tipping the scales just shy of 6 lbs., with all ten fish sportingly released. Good fortune continues for Belfast angler Colin Wright who fished with Basil for three days. The pair landed 39 trout on a mixture of wet and dry flies with wets out-fishing the dries. Best fish was 4 lbs. 4 oz. On Wednesday and Thursday last, Northern Ireland anglers, Frankie Martyn and Victor McKrevitt Cumber, had 11 trout for their two days angling. Tom Kelly reports that Carlow duo, Jimmy Carew and Niall Malone, had good sport on the dap in the Oughterard area catching 7 trout over two days for 12 lbs. 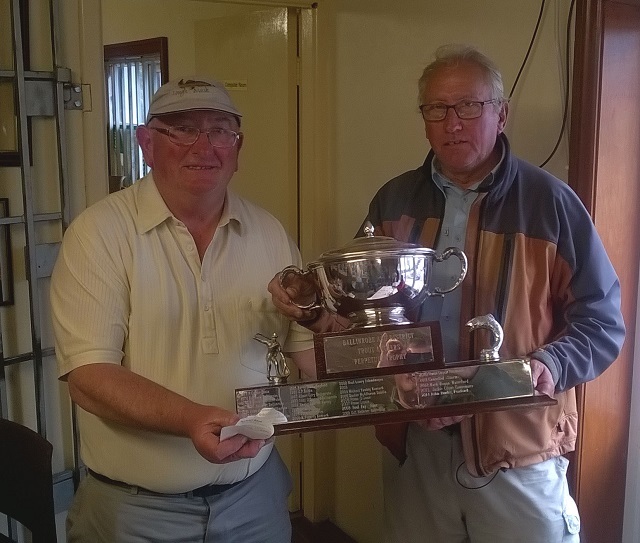 During the week, the Commercial Boat Club Woodquay Galway hosted the Willie Lally Cup which was won by Richard King with a trout of 3 lbs. Kevin Molloy of Baurisheen Boat Hire (087-7573782) also had good trout fishing on wet flies in the Oughterard area catching 3 trout last Friday on mayfly patterns. On Saturday last, former Irish Ladies International, Dorrie Gibbons, hosted a charity competition which saw the proceeds go towards a sensory garden for children with special needs who attend Cong NS. Basil Shields took top prize with 4 fish and a total weight of 9 lbs. 3oz. Eddie Gibbons was in second place with 3 fish weighing 5 lbs. 82oz. Third place went to Cornamona angler Tom Doc Sullivan with one fish at 3 lbs. 16oz; Tom was also Heaviest Fish winner. Fourth was Seamus Kelly with 2 trout weighing 2 lbs. 72 oz. Top Ladies rod on the day went to Kenmare woman Niamh Breen. In total, forty-three rods caught 22 trout with a weight of 37.75 lbs. The Competition was dapping and fly fishing and could be fished on both Lakes Corrib and Mask with 15 trout (27 lbs.) coming off Corrib and 7 trout (10.75 lbs) coming off Mask. The weigh-in took place at Lydon's Lodge Cong (094-9546053) in which a great evening was had by all. Larry McCarthy of Corrib View Lodge Glencorrib (087-9135222) reports of great fishing on Lough Corrib in the last week with both sedges and mayflies bringing trout to the surface. Pip Arnold from Belfast fishing with Larry over two days boated 24 trout between 1 lbs. and 3 lbs. with the majority around 1.5 lbs. All fish were caught on dry sedge patterns and yellow dry mayfly patterns and were all sportingly released. Two days with Frank Kelly and Tony Harten from Cavan produced 12 fish with the majority in the 2 lbs range and more risen and missed, while Steve Wilkinson, UK, also enjoyed a good day's fishing on Corrib with 8 trout on wet may fly patterns. Hopefully a settled period of weather will arrive and we should see some more good fishing on the Corrib. Ronan Cusack reports that there were large numbers of anglers out on Lough Mask this past week, as the 2015 World Cup fast approaches. Unfortunately, angling has become a bit more challenging, possibly due to the unseasonal cool temperatures and high water levels caused by the constant rain we have had to endure over the past few weeks. Fly hatches this week have been good, with plenty of sedge and mayfly for trout to choose from on a daily basis. Ballinrobe & District Anglers held there annual club competition over the weekend. A total of 37 anglers took part, weighing in 29 fish. In first place was Kevin Sheridan, Ballinrobe, with 3 fish for 4.53 lbs. Second place went to Jonathan Craven from Roscommon with 2 fish for 3.53 lbs. and John Burke Foxford took third position with 2 fish for 3.00 lbs. Heaviest fish went to local angler, Sean Maloney, with a trout of 1.58 lbs. Ennis Anglers also held a 2 day competition over the weekend, which was fished to a 14 inch limit. Thirty-four anglers competed, with only 11 trout making the cut off. The majority of boats fished across the deep in the middle of the lake but anglers struggled to get trout to measure. Reports were that trout in the deep were coming short and 13 inch fish were difficult to come across. Fortunately, the weather outlook for the weekend is for more rain and moderate winds. The salmon fishing at Costello and Fermoyle continues to be very productive with 64 salmon recorded, 42 of which were caught this month. There is concern regarding the scarcity of sea trout this year with only 117 landed to date. The good news is the sea trout rod catch has dramatically improved recently with 44 recorded in the last few days, most of which were fresh. The highlights since the 13th July include the 4 salmon and 23 sea trout Denis and Donie landed on Fermoyle and Clogher loughs, which was a fair achievement considering the difficult conditions they encountered over the few days they fished. Neil Spellacy was not disappointed with the 2 fresh salmon he landed during his day on River Beat 1, fish of 6lbs 8ozs & 3lbs. Local angler, Myles Costello, also landed a bar of silver (7 lbs.) during his evening on RB1. Newcomer to salmon angling, Udo Nitschke, certainly earned his stripes on RB1 after he caught fish of 6 lbs. 8oz. & 4 lbs. 8oz. Regular visitor from Edinburgh, Pete Westwater, had 2 productive days on Glenicmurrin & Fermoyle Loughs, landing a respectable 23 sea trout. Eamon O Brien fished Glenicmurrin over 2 days and was rewarded with 21 sea trout and a grilse. Finally, Geoffrey Fitzjohn and Neil Spellacy had an excellent morning on River Beats 3 & 4, both landing 2 salmon each, 3 of which were 7 lbs. and the remaining a fish of 5 lbs. 8oz. Before the sun came out they estimated that they must have encountered at least a dozen fish. Well worth the walk! With water levels remaining favorable, the Erriff Fishery produced a total of 32 salmon over the last week. Reinhard Stopper from Germany had a 6 lbs. grilse on a Cascade as well as losing a fine salmon estimated at 9 lbs. after a 10 minute struggle. Neil Spellacy caught a fish of 9 lbs. which he sportingly released, while Colin Trohear landed 2 grilse weighing 4.25 lbs. and 5.5 lbs. releasing 1 of these. Gerard Garnier returned to Aasleagh Lodge having a red-letter day catching 10 grilse in one day most of them released. Other successful anglers included local man, James O'Neil, who had 2 grilse for an evening weighing 2.25 lbs. and 4.75 lbs. and John Casey who also got a nice brace of salmon weighing 5 lbs. and 12 lbs. respectively both of which he sportingly released.